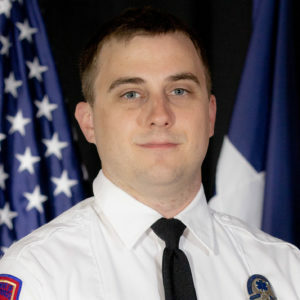 Kyle Schutt is a Paramedic who has been employed with Austin-Travis County EMS (ATCEMS) since 2015. Kyle believes being a public servant is a rewarding job that requires hard work and dedication but comes with the knowledge that you have made a difference in someone’s life. Additionally, it is his belief that all members of EMS share a passion for going the extra mile for our patients, and that is what makes our profession special. During Kyle’s three years at ATCEMS, he has received two Medical Phoenix Citation awards for confirmed cardiopulmonary arrest saves who were discharged from the hospital, and he has recently been promoted to the Medic II position. Kyle received his Paramedic certification from the University of Texas Health Science Center and his Bachelor’s in Exercise Sports Science from Texas Tech University.